I had the chance to review the Kwik Stix Solid Tempera Paint Sticks with my kids and I think we found a new favorite way to do art! Keep reading for our review and be sure to check out the giveaway at the bottom of this page. These would be the perfect stocking stuffer for Christmas! 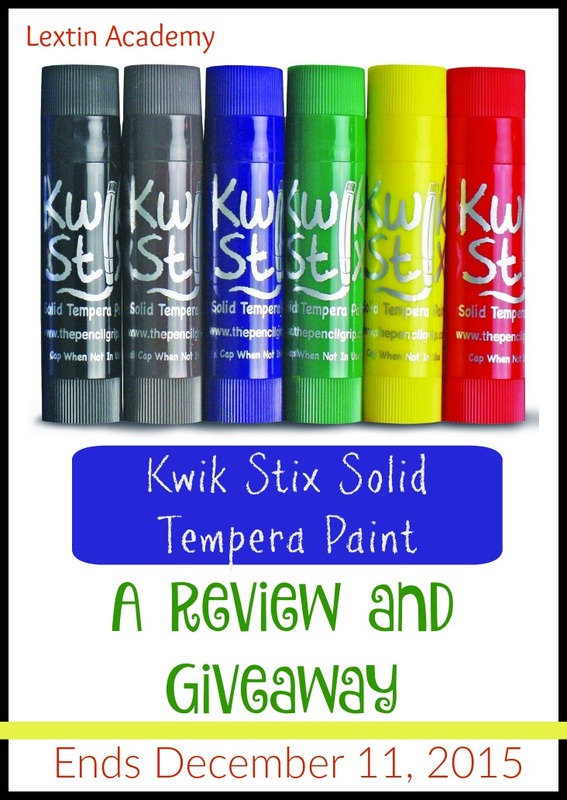 Kwik Stix Solid Tempera Paint Sticks from The Pencil Grip Inc. are tempera paint in a solid form – think painting with something like oil pastels. There is no mess and no clean up! My kids described their painting experience as “painting with chapstick.” And if you have a toddler I can bet that they’ve tried to paint with chapstick once or twice. This means that these paint sticks are perfect for the little people in your life. All of my kids ages 9, 7, 6, 4, and 3 used these sticks and they all loved them. In fact, my kids exclaimed that these were their “favorite” and my oldest daughter said they were the “best way to paint so that no one is messy.” Yes, I have to agree! The paint goes on smooth and dries in just 90 seconds. The colors are bright and don’t fade. I love that I don’t have to pour more paint for my kids or clean any brushes. They just twist up the paint sticks and continue painting. So very easy! These are my new favorite art supplies and my kids have been using them just about daily since we received them. Now I just need them in new colors like pastel, neon, or even glitter. Check out my giveaway below to enter your very own set of Kwik Stix! Giveaway open to US residents only. Winner will be selected at random by Rafflecopter and will have 48 hours to respond to email. I will verify the winning entry. If the winner does not respond within that timeframe, a new winner will be selected. The product offered is free of charge, no purchase necessary. Facebook, Twitter, Instagram, and Pinterest are not affiliated with this giveaway. By providing your information on this form, you are providing your information to me and me alone. I do not share any information and will only use your information in order to contact the winner. Our all time favorite art supply is colored pencils. So far, our fav art supply is colored pencils. Every time I see some on clearance, I grab them b/c we go through them so quickly! Mi kids like to use colored pencils. I have never heard of these, they sound fun though! My daughter enjoys using her oil and chalk pastels during art time! I would have to say that is our favorite art supply at this time, but I could see her LOVING the Kwik Stix. What a neat idea! Thank you for the opportunity to win! I'm not sure that we have just one favorite, but I think right now, my girls love paper– color it, paint it, stamp it, write on it, tear it, origami shape it, draw on it… we are grateful for paper! I think these Stix would be so fun to use. We are always looking for paint supplies whether at a garage sale or at stores. My youngest likes to use his dot markers.